Phillip Ashley Chocolates is owned by Phillip Ashley Rix. The store is located at 1200 Madison Ave., in Madison Heights. You can view the chocolates on Instagram and Facebook. Could you give a brief history of yourself and your business? I’m from Memphis. I was born and raised here. I actually went to Bartlett High School. I went off to MTSU, then worked for several businesses- FedEx, Apple, that sort of thing. So, I was doing the whole corporate world stuff. Then, around 2007 I woke up from a dream one day and said, “I’m going to make chocolate,” and proceeded to spend the next several years in a totally emergent state to really learn chocolate. I didn’t go to culinary school, so I’m self-taught. I just did a bunch of studying, a bunch of reading, travel, and research to really take it all in, learn about food in general, learn about ingredients, and how people taste things over the course of about 3 or 4 years. I figured out how to manipulate chocolate and really do the things that I wanted to do which is put bleu cheese in it or create a sweet potato chocolate or any of these other intricate and fancy pieces that we do. That’s understanding the science, art, and history of it all. What inspired you to move your business to the Medical District? I needed the space. We had gotten to the point where it was hard for us to be able to provide the level of service that we needed, particularly during the holidays when we’re trying to fill online orders and corporate orders, but also still welcome people into the store and not have them overwhelmed with boxes everywhere and that kind of thing. A lot of it was just capacity and space needs, but also wanting to find an area of the city still in Midtown, but where the traffic was a lot heavier, the audience was more vibrant, and be more accessible—parking, visibility, time access, etc.. Our hours will expand as well. What kinds of supports have you received from the Memphis Medical District Collaborative? The Medical District, in general, has been fantastic. Vonesha, her team, and the folks at MMDC have been really good in terms of informing me of all available resources to me and providing any guidance on questions that I had regarding predevelopment, the façade, and future goals for my business. Neighbors have been super welcoming as well— business and property owners alike. It’s been a very welcoming process. I have also received a grant for façade, lighting, and signage enhancements from MMDC. 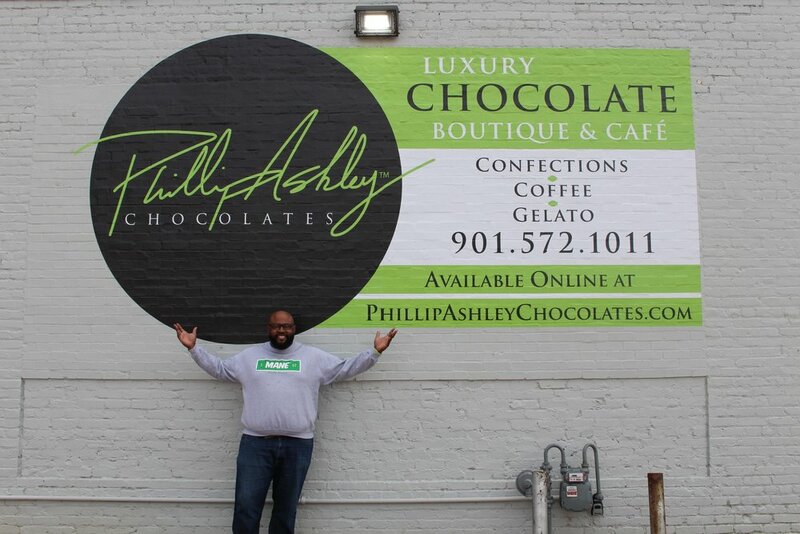 What can people expect from Phillip Ashley Chocolates in the Medical District (programming, ambience, environment)? There is definitely an enhanced ambience. Before, it was simply just retail. Now, we have more of a café component because you will be able to come in and have a meeting. We will have complementary wi-fi available as well. We will also start serving coffee, so you can come and get a cup of coffee with a complementary refill. We will always have chocolates and make suggestions on what chocolates would pair best with your coffee and other treats we will be offering. We will also be hosting a regular panel/discussion event called ‘The Sweet Talk.’ The first one will be held on Friday April 12th with a Women’s History Month theme. Then, every six weeks or so we will bring in someone who can speak about a subject matter or an artist that is interesting and that people want to listen to and hear from. In addition, we will feature visual artists in the store each month. I’m a big fan of art, in particular, painting. We’d like to have a gallery of sorts for guests to observe and support local, national, and global artists. Overtime, we’d like to do more things that engage our community, our customers, and provide a place that they can be proud of. In many interviews, you speak a lot about the importance of empowering the communities surrounding your business through partnerships and programming. What makes this focus on community so important to you? Why is this a key component of your business? I think giving back is just an important thing in general. When people are coming in and spending money with you— which they don’t have to — and really enjoying what you offer, I think it’s definitely a responsibility. I’m a giver by nature, and I want to do more than just be here, own a business, and be insulated from everything that’s going on. I want to be able to help other businesses grow and thrive. I want to be able to help other community organizations work towards their missions where it aligns and where we have the ability to help. We would also like to be intentional about hiring community members and providing opportunities for individuals become increasingly mobile in this economy. That’s why it’s really important to be involved, but also stress the importance of customers coming in and supporting these efforts through buying chocolate. The more that people do that, the more we’re able to help and make an impact. Do you have any specific community partnerships that you’re thinking about forming as you enter this new space? We’ve talked to several organizations. We’ve been helping LeBonheur for some time. We do work with St. Jude as well. We’re even looking into helping out Opera Memphis. We’ve worked for several years with OUTMemphis, the Memphis Black Art Alliance, and so on. We’d like to support the local artist community and beyond. Now, I’m trying to narrow down and be specific about the constant focus areas that we will be committed to. What are your signature/most popular items? Our chocolates by far are our most popular. We have some other peripheral products, but our designer chocolates are what we’re known for. I’ve made hundreds of different flavors over the years. By far, our most popular collection is the Taste of Memphis collection. That’s something that we’ll always have on hand. It will already be pre-boxed and ready for people to pick up as a gift. Some of our top chocolates are the Mama Jean—the first chocolate I made. It’s a sweet potato flavored chocolate named in honor of my grandmother. Savoy, a French bleu cheese chocolate is a very popular chocolate as well. We do giant turtles—pecan, white chocolate macadamia, and bourbon pecan with dark chocolate. The turtles are really popular as well. Will you be having any promotions or specials? We will have a $49/month subscription program where we’ll send you a box of chocolates with an exclusive flavor each month. These will be flavors that you won’t find in store. They’ll also be able to get a 10% off when you shop online or in store, as well as updates and invitations to all of our events. We also do business gifting. We have two levels to our Business Select Program—an Executive membership and Corporate Membership. You are nationally renowned. How do you balance all of what you do nationally and locally here in Memphis? Can you give a background of how you were able to scale nationally? Part of it was just being hungry. I had an idea, I had a plan to bring that idea into fruition and for it to thrive and have definitely made a ton of mistakes, that’s for sure, but I think really understanding marketing, communications, and how to promote was also essential. One of the things that I learned very early on in my career is that people have to buy into you before they buy from you. People definitely want to know your story, and we’re very much so getting back into a day and time where people want to connect with whatever it is that they buy and spend. People always do the research of things, but people really want to feel connected. In my case, buying the chocolates, meeting the chef, and being able to associate the store and brand with connections are an example. People really want to feel like they matter. It’s not so much about the money, but that they are appreciated—even if it’s through just the fact that when they bought something, and they were blown away by the product. We’ve been able to tell that story through social media and doing events like the Grammys, Emmys, and Oscars. Those things—particularly from a national stand point— have helped us really grow. Also, being in Forbes and even getting some international press has all come along and helped our growth. But, then, I try to always point back to Memphis and my origins from here, saying this is where we’re based and this is where we make the chocolate. So, even on the cards that we give, they have our business information and say “Crafted in Memphis. Coveted around the world.” So, we still celebrate being form here and the fact that so many great things are here and have come from here. Do you have a most memorable event or most memorable interaction with someone through your business/catering? Yeah, and I use this to this day. One of the questions I get asked all the time is my favorite chocolate that I’ve ever made. Before, I’d say this or that or I don’t know. In 2016, we were doing all the chocolates for the Grammys, so we were there backstage at the rehearsals, the week before, and for the actual day of the Grammys. During all the rehearsals, we were backstage and they were having a press day and all that when Stevie Wonder comes over and we’re just talking and chatting it up, exchanging recipes. While we’re talking, reporters came over to ask Stevie what his favorite song is that he’s ever written and his reply was, “I haven’t written it yet.” As soon as he said that, I was like, “I totally know what you mean. I’m totally using that!” So, now when people ask, I tell them I haven’t made it yet. That’s one of the reasons I’ve made so many different chocolates. Over time, I’m constantly trying to out-do each flavor, I’m constantly re-imagining new flavors and how to push the boundaries. I’m always looking for that favorite piece, which is why we keep making chocolate. How can people get in contact with you and your business? We’ve always liked to push people to the website, phillipahleychocolates.com. Also, I am very heavy with communicating on Instagram in particular @phillipashley. On April 12th, we’ll have a Women Entrepreneur’s panel with 5 panelists. That will be fantastic. That Saturday, April 13th, we’ll be open from 10am-6pm for our Grand Re-Opening. Then, we’ll have an after party on the rooftop of Hu Hotel, which is the former Madison. We’ll have a DJ and the bar will be available as well. We’re also doing some stuff for Memphis Fashion Week during that time. June 9th is our next big tasting at the Memphis Botanic Gardens from 1-5. It will be an URBN Tea Party chocolate and cocktail tasting. Dress up in Derby attire, wear your fascinators, seersuckers, and all that. We will be serving hors d’oeuvres, kind of brunch style and we’ll be serving champagne, bourbon, and mint juleps. In October, we’ll have our Memphis Masquerade. In November, we’ll have our Big Whiskey Tasting event.